On Saturday 24th March a few members of the North Kelvin Community Council gathered on Queen Margaret Drive at the opening to Oban Lane, not sure what to expect. We were greeted by Carol of Glasgow Community & Safety Services who had brought along plenty of rubbish bags, litter pickers, gloves and needle disposal boxes. It was the ﬁrst time weʼd organised a community clean up, and we werenʼt sure how many people would come. It was a beautiful afternoon, which we hoped would help! Gradually the crowd increased as we were joined by local residents. In the end a magniﬁcent 27 people turned out, all willing to help. 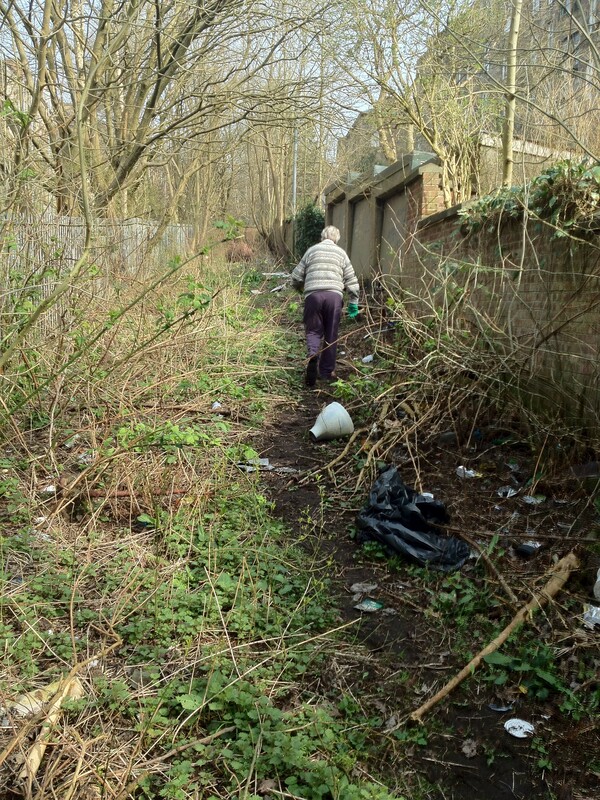 Weʼd been approached by George, a local resident, some months before when heʼd let us know how bad the dumping and rubbish had become, and asked if there was anything we could do to help. Because the lane is a private lane, the Council wonʼt take responsibility for the clearing and maintenance of it, and so it had become a real mess. As a Community Council we were keen to do something active about the problem, and felt that a Community Clean Up would be just the thing. Oban Lane runs down the hill between Fergus and Oban Drives, and into Queen Margaret Drive. Itʼs split in the middle, so you can only access the bottom bit from Queen Margaret Drive, and the top bit from half way up Oban Drive. On the day we focused on the bottom bit of the lane. We picked up litter, cut back overgrown brambles and bushes, felled nettles, and cleared all the rubbish that had been dumped in the lane over the years – old Christmas trees, bricks, bits of wood, and assorted bits of machinery. 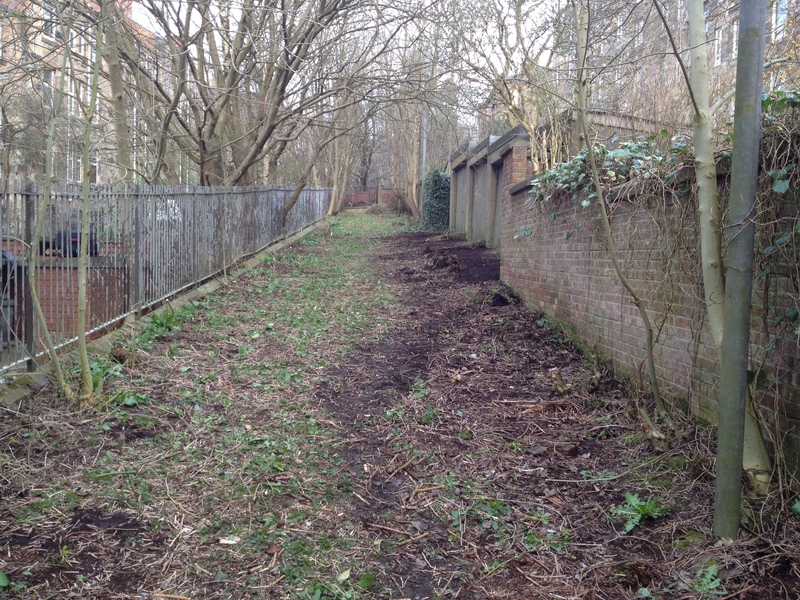 You can see from the photos below the state of the lane before we started – and how much rubbish we cleared! With 27 willing pairs of hands we managed to clear the whole bottom end of the lane in 2 hours, and left all the rubbish for collection by Glasgow City Council. With just a short break for welcome refreshments on such a warm day we really appreciated all that help, and itʼs great to know that people in the local community do care. We are going to tackle the top of the lane next (the bit that is accessed from Oban Drive). Weʼve also decided to invite a representative from Glasgow City Council along to one of our monthly meetings, to explain to us about the ownership of the lanes in the North Kelvin area, and help us to understand how they can be better maintained. Look out for the posters on lamp-posts and in local shops where weʼll advertise the meeting, as you can come along if youʼre interested. Thanks to George for starting the whole process, Carol for bringing along everything that we needed to clean up the lane safely, the North Kelvin Meadow campaign for donating shears, loppers and a wheelbarrow, Glasgow City Council for collecting all the rubbish that we cleared, and to the 27 people who volunteered their afternoons – we couldnʼt have done it without you! The lanes were impassable, as I found out to my cost some years ago when my cat went awol. I have lived in Fergus Drive for 36 years, the bend in the lower lane backs on to our back green and has always been an eyesore, a dumping ground, occasional gathering point for undesirables and addicts, and I am surprised to hear they are privately owned. The lane has never been used in my time and there is no access to it from the back greens. they would be much better closed off – at the moment they are simply a nuisance with youths trying to gain access to the properties by climbing over the wall, and the trees and seedlings growing there threaten the stability of the boundary walls. Thanks so much for commenting. As far as I understand (and I may be wrong – I’m waiting for clarification from the Council) the lanes have always been privately owned – jointly by all the properties that back on to them, but at some points in the past I believe that the Council may have taken on the maintenance of the lanes. However, now that money is tighter, this is not something that they will continue to do. Closing the lanes off is an option that has been mentioned – but even that would take money, which would be expected to be put up by the joint owners of the lane. They would also be expected to maintain the lane, boundary walls, etc. If it’s something that the owners wish to do, I think there would be options for applying for funding in order to close off the lanes. This may be something that the Community Council can help with.